Christopher R. Flowers, MD, director of the Lymphoma Program at Winship Cancer Institute of Emory University and associate professor of Hematology and Medical Oncology at the Emory School of Medicine, has been elected to the American Society for Clinical Investigation (ASCI). A formal induction ceremony for new ASCI members was held on Friday, April 15 in Chicago. 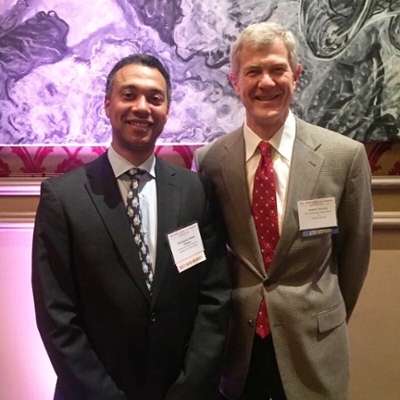 Flowers was nominated by ASCI member Scott Ramsey, MD, PhD, of Fred Hutchinson Cancer Research Center (pictured right with Flowers). Established in 1908, the ASCI is one of the oldest and most respected medical honor societies in the United States. Physician-scientists across all medical specialties are elected to the Society for their outstanding records of scholarly achievement in biomedical research. Several hundred early career physician-scientists are nominated every year and up to 80 new members are selected for their significant research accomplishments. Flowers is an internationally-recognized leader in lymphoma clinical care and outcomes research. He has applied this expertise to mentor minority investigators and junior faculty in clinical research. His groundbreaking contributions in cancer health disparities research provided new insights into the understanding of the clinical manifestations and etiology of racial differences in lymphoma. Flowers joins twenty Emory physician-researchers who are currently ASCI members.